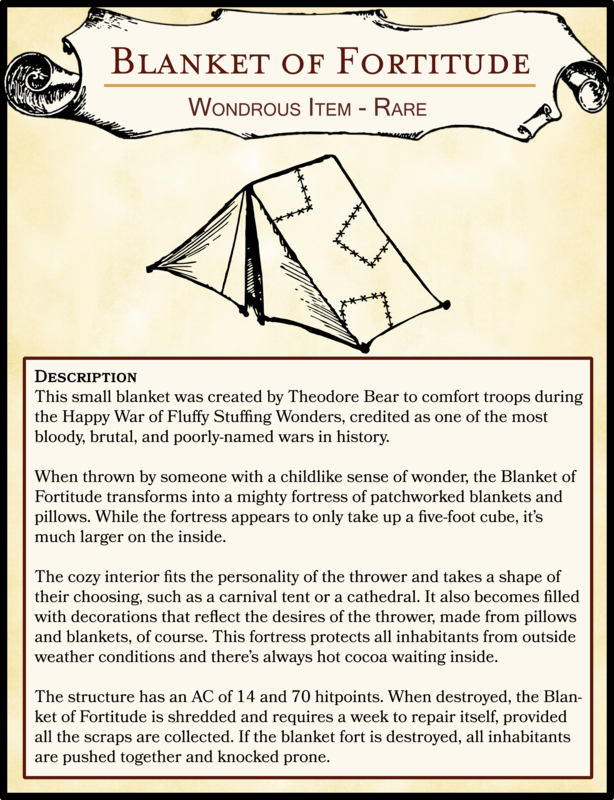 This small blanket was created by Theodore Bear to comfort troops during the Happy War of Fluffy Stuffing Wonders, credited as one of the most bloody, brutal, and poorly-named wars in history. When thrown by someone with a childlike sense of wonder, the Blanket of Fortitude transforms into a mighty fortress of patchworked blankets and pillows. While the fortress appears to only take up a five-foot cube, it’s much larger on the inside. The cozy interior fits the personality of the thrower and takes a shape of their choosing, such as a carnival tent or a cathedral. It also becomes filled with decorations that reflect the desires of the thrower, made from pillows and blankets, of course. This fortress protects all inhabitants from outside weather conditions and there’s always hot cocoa waiting inside. The structure has an AC of 14 and 70 hitpoints. When destroyed, the Blanket of Fortitude is shredded and requires a week to repair itself, provided all the scraps are collected. If the blanket fort is destroyed, all inhabitants are pushed together and knocked prone.